Jimmy is known for getting inside his athletes' heads and his emphasis on training the mind like a muscle. Since 2002, he has coached more than a two-thousand adults (and young people) to run further and run more efficiently by creating an uplifting environment to propel people to break through self-imposed glass ceilings. 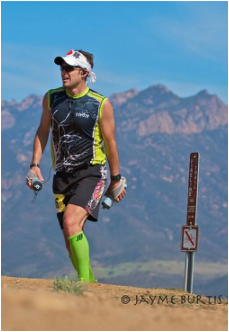 Jimmy has been running competitively for 30 years (200+ races, including the Angeles Crest 100, the Western States 100 and Badwater 135) and has over 14 years of coaching experience tackling ultra endurance over the last decade. He has helped many runners & athletes to complete their first ultra races and 100 milers, and has personally completed 28+ races of 50 miles (or further) while failing to finish 5 races over that stretch. Personal bests include a 1:18 Half Marathon, 2:56 Marathon, 3:56 50k, 7:07 50 miler & 17:34 100 miler. Jimmy is also the father of two kids who can out-endurance him any day. Kate completed her first race in 2002, the Kona Marathon (in 4:59:51). She has since gone on to complete over 30 marathons. For three years, she coached marathon run/walk teams for Team in Training benefiting the Leukemia & Lymphoma Society. Kate has qualified for the Boston Marathon over twelve times and has run it twice. In 2006 and 2007 she focused on triathlons, most notably placing third in her age group in a full Ironman distance triathlon. In 2009 she ventured into the world of ultra-marathons, completing numerous of 50k’s (winning five of them), three 50-milers, a 100k and two 100-mile trail runs. Her current goals are to improve her marathon time (2:58:30), test the boundaries of what she can run on the trails and inspire as many people as possible along the way. By day she exercises her other passion for the arts, as a creative director for a beauty company. But her early mornings and evenings are always spent running with and training the best people on the planet! Oh, and she is also a mom of two rascally kids.